Marc Fraser produces a wide range stoneware and porcelain which are hand dipped in a variety of blue and green glazes, creating rich surfaces of beautiful subtle colours. 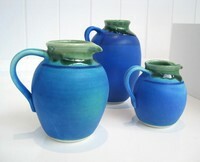 The range includes different sizes of bowls and jugs; olive-pots, also mugs and vases. All work is dishwasher-proof and all are high-fired in the kiln which makes strong, robust pots.